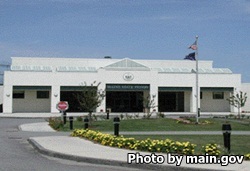 Maine State Prison is located in Warren Maine. It is a medium to closed custody/high risk prison that can house over 916 adult males. Some minimum custody offenders are housed here while they wait to be transferred to a minimum custody facility. High risk prisoners are housed in the special management unit, which consists of three pods of single cells. Protective custody and reception inmates are housed in the closed custody unit which consists of six pods of single cells. The Medium Unit houses medium and minimum custody offenders in double cells. Inmates can participate in educational programs that allow them to earn a GED, adult basic education and a variety of vocational skills in horticulture, upholstery, woodworking, and music. Substance abuse treatment is available in both group and individual counseling sessions. Once you have been approved you can visit an inmate during walk-in hours Thursdays through Sundays during the following sessions 8:30am-10:30am, and 1:30pm-3:30pm. In addition if the inmate is a general population inmate housed in the close custody unit, or medium custody unit they can have visits Thursdays through Sundays from 6:30pm-8:30pm. Non-Contact visits must be pre-scheduled Monday-Wednesday by calling (207)-273-5302 between the hours of 8:30am-11am and 2pm-5pm.